Millennials, the world’s largest generation, will make up 75% of the workforce by 2030. A new book, The Millennial Whisperer (Morgan James Publishing, 182 pages, $24.95, Hardcover, ISBN: 978-1642792799, February 12, 2019), by 38-year-old ad executive Chris Tuff, provides practical strategies that are real-world tested and research-based. He shows companies how to improve culture and morale while increasing profitability. Tuff knows what it takes to succeed in the workplace and manage Millennials. He became the youngest to make partner at the century-old advertising agency, 22squared. Tuff’s book bridges gaps in communication between Millennials and the rest of the workforce. 1. 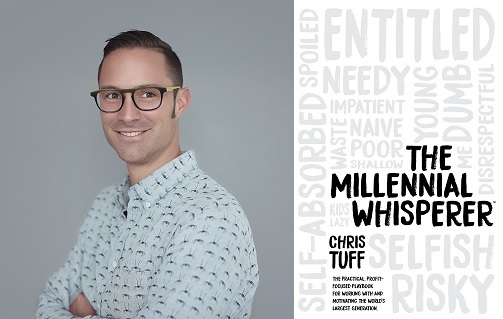 Chris, what inspired you to pen your debut book, The Millennial Whisperer? On an executive men’s retreat in North Georgia, I introduced myself by saying “I’m kind of like the Millennial whisperer at my firm…” This prompted a Q&A session between the executives and me about how I did it. When I sat back down, the guy leading the retreat, Tommy Breedlove, turned to me and said “You better write that book!” For the next two weeks, I wrote down all the strategies and pulled together the best and latest research on leading a very misunderstood generation well. It quickly became my calling to help transform the workplace for all generations. 2. What exactly is a “Millennial Whisperer”? A Millennial Whisperer is someone who understands how to attract and motivate the Millennial generation. A true Millennial Whisperer can attract and motivate Millennials without throwing a pile of money at them or replacing your conference table with a ping pong table. A Millennial Whisperer is someone who understands and can implement the little things that make a big difference. I wrote the book with this goal in mind—the book needed to be a painkiller, not a vitamin. 99% of business books are vitamins. They give you a quick boost but the moment you are done with the book, the pain returns. Not here. 3. So how does one motivate the world’s largest generation that is scheduled to be 75% of the U.S. workforce in 2030? Most organizations still function the same way they did twenty years ago. But Millennials and most leaders have undergone dramatic changes during that time. From technology to the Great Recession, and everything in between, the world is different now than it was. For example, millennials crave inspirational leaders, have zero tolerance for hypocrisy, and want transparency. We leaders must bring inspiration to the workplace, be honest with what we do, and be human with our Millennial team members. That costs nothing but will achieve a quick return in productivity and culture improvement. 4. What are some of the myths you debunk about Millennials? After reading the book, a friend of mine called me and said he thinks he got it. “Millennials aren’t the problem, they just expose the problems.” It is true. Millennials are not the lazy, entitled, avocado-eating, pessimists they are held out to be. Some are, just like some other people are lazy, entitled, avocado-eating pessimists. But you can implement simple strategies to attract the best ones, inspire and motivate them to produce, and incentivize them in ways that are profitable to you and effective with them. If companies want to keep up they MUST learn how to motivate this generation instead of just calling them needy. They must embrace and empower this generation. 5. So how can business leaders and managers harness the strengths of Millennials? This group is innately entrepreneurial, innovative, and resourceful. Build up your team members to be problem solvers. Share the purpose of their work and the vision for your team, department, and company. Give them parameters within which to work but give them autonomy within structure. If we give them a checklist of exact steps with every task, they will end up like call center operators who do not know what to do outside of their script. For example, in the book I suggest “building hallways, not train tracks.” In other words, build walls around them so they cannot veer too far off course but leads them in the direction you need them to go. 6. You say that Millennials care less about titles and financial rewards at work. So what’s important to them – and do you help motivate them at the office? Financial rewards, culture, and work flexibility are their three most important drivers. That is not much different than older generations. But they care about much more than that, partly because of their experiences and life stage. Millennials come out of college with tens of thousands of dollars in debt. The reality of their situation is they have so much debt they cannot wait until it’s gone to enjoy life. So they want to enjoy their life and work now, even if it means delaying paying down their debt. We can help them achieve that by leading with both inspiration and order, even it takes having two leaders in regular contact with them, one inspirational and one organizational by nature. This creates an engaging environment with organizational security. 7. Can you share some best practices for recruiting and hiring Millennials? First, define your organizational purpose and what makes your company unique from a culture perspective. This sets you apart from your competition and helps you communicate to people what you contributing to the world as a whole. Second, build a culture that makes Millennials want to work with you. Demonstrate that culture inside your company as well as through how you present yourself online where Millennials can see them. Third, make recruiting a year-round focus. Instead of waiting for positions to open to fill them, empower team members to look for people who fit your organizational purpose and culture and refer them to you year round. Get to know those candidates over time. This makes you much more proactive with your recruitment to identify the best fits. Finally, involve your team members in the selection and courtship process. 8. What type of culture helps Millennials thrive? Companies need a defined culture and it is much more than throwing a ping pong table in the corner. Culture is defined by those who live it every day. Involve key employees in the process of defining your culture. Culture will evolve over time but starting by rewarding inclusion, diversity, creativity, honesty, accountability, acknowledgment, and collaboration will begin to help Millennials thrive. At our company, 22squared, the easiest way to define our culture is to point out the hashtag #22culture on social media. You will find more than 3,000 posts from employees expressing what the culture means to them. 9. Why do you say Millennials need purpose, profit, and acknowledgment? This group grew up with social media at their fingertips. Many had helicopter parents. That’s right, we can blame ourselves in many cases when we complain about this generation. We encouraged them to pursue their dreams. We gave them constant feedback. We encouraged them to pursue career paths that involved tens of thousands of dollars in debt. They need purpose because they grew up with parents who encouraged them to pursue their dreams. They need acknowledgment because with social media and constant parental and educational feedback, they have become conditioned to it. And they need profit for many of the same reasons we all do, only they start with thousands of dollars in debt that many from older generations did not have. 10. You also say leaders should “hero their people.” How does one do this? We must build our people up! This comes in the form of “heroing” your people publicly and behind closed doors. You make them the heroes. And you are the guide who helps them by giving them the inspiration and resources to do their best work. For example, instead of traditional status meetings, my team and I go around the room offering praise for help on projects. A team member will openly thank another team member for help on the project. We then briefly discuss the project and move onto the next person. Thirty minutes or so later, we have collected all the information we would normally have from a status meeting but everyone walks out a hero. This entry was posted in Uncategorized and tagged author interview, author Q&A, book pr, book promotion, book publicity. Bookmark the permalink.